Converts from a vertical truck to a horizontal platform cart in seconds. Steel convertible trucks are designed for maximum leverage and maneuverability and can handle loads up to 800 lbs. in either the vertical or horizontal positions. Steel trucks stand 46" high and adjust up to 61" vertically. 8" x 14" toe plate and 12" x 36" platform keep loads from slipping off. 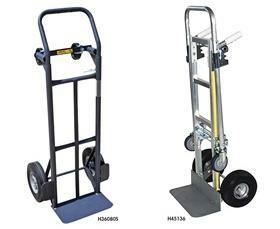 Trucks convert from 2 wheel hand truck to 4 wheel platform cart in seconds. Available with either pneumatic or puncture-proof wheels. 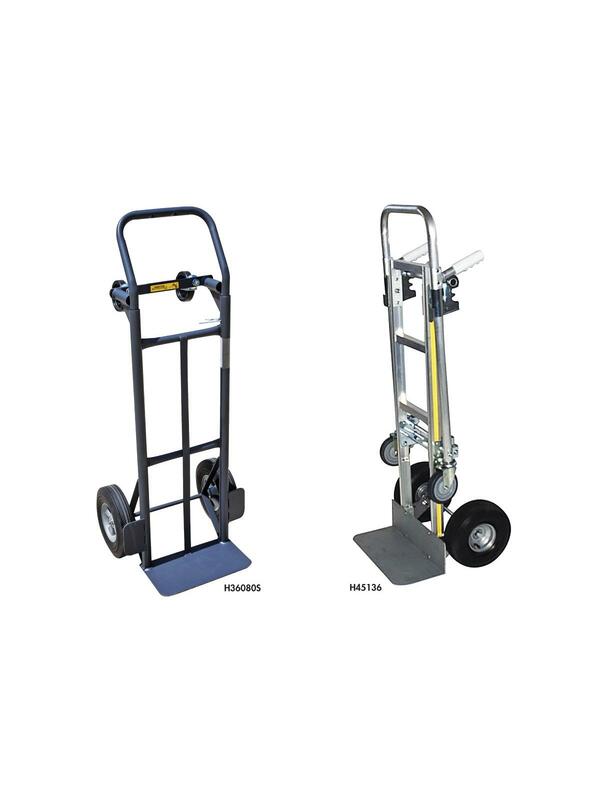 H45136 Aluminum Convertible Hand Trucks feature a larger beveled toe plate and wheel guards with 800 lb. capacity in a Vertical position and a 1,000 lb. capacity in a Horizontal position. 12 x 38" in platform position. FOB Shipping Point.